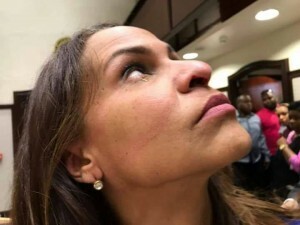 A tumultuous meeting of Curaçao’s Parliament in which the “new majority” demanded that the National Decree of the outgoing Koeiman Cabinet to dissolve the legislature and call early elections be either withdrawn or amended resulted in a scuffle that sent MAN-fraction member Giselle McWilliam to the hospital. During the debate she had referred to the still ongoing investigation into an order of mouth caps for the –no longer existent- Bureau Sickness Cost Provision BZV that were never delivered. Current MFK-parliamentarian Jacinta Constancia was Health Minister at the time and is still considered a suspect. At a certain point an argument ensued and Constancia apparently slapped McWilliam in the face, causing a nosebleed. 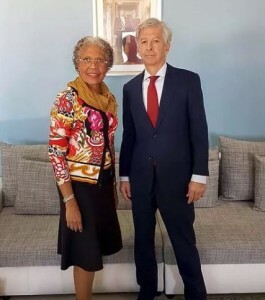 She reportedly went to the hospital for treatment as Parliament President Gilmar “Pik” Pisas (MFK) struggled to restore order in the assembly hall. The meeting had been requested by the fractions of MFK, KdNT, PS and MP plus independent parliamentarians Eduard Braam (ex-PAR) and Gassan Dannawi (ex-MAN), good for 12 seats in the 21-seat house. They claim caretaker Prime Minister Hensley Koeiman, who could not attend because he is in Aruba, had merely been taking revenge after his government lost its majority backing. Calling the MAN-leader a “bad loser,” MFK-leader Gerrit Schotte said Governor Lucille Gorge Wout would be put in a difficult position to correct a situation she had herself created by signing the decree, while she knew there was already a new majority in Parliament willing to form another government. He wants the snap elections either cancelled or at the very least postponed and promised they would adopt motions to that effect. The fractions of MAN, PAR and PNP stuck to their guns, saying that with elections announced for April 28 and preparations in full swing the date could not be changed. They also blasted the others for criticising the governor while she cannot defend herself.